Who is that dashing stranger at the pub? The vest makes the man - an easy, comfortable way to look well-dressed and just a bit more intriguing. 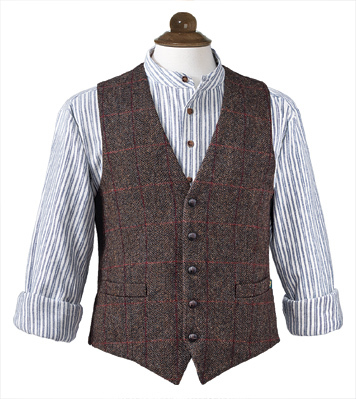 Vest of Irish-woven herringbone tweed in traditional tailored styling with two welt pockets in front. 100% wool front, with a full tweed back that adjusts for fit. Dry clean. Sizes S-XL. Coordinating Tweed Cap in sizes S-XL. Homespun shirts have clothed the Irish working man for generations. The blue-striped flannel of this modern version offers comfort and durability, banded collar and button placket offer timeless style. 100% cotton; machine wash. Imported from Ireland. Sizes S-XXL. My son loved all his birthday gifts from Gaelsong! Thanks for making this birthday special! My Husband absolutely loves the grandfathers shirt! Perfect fit! Company is fantastic to deal with! Would order from them again! I gave this as a gift to my husband and he said that it was really soft - I agree. He looks wonderful in it! Both the shirt and the vest are the perfect fit and look very handsome on.